Nothing speaks to the flavors of Oktoberfest more than pork and sauerkraut. This easy recipe for German Pork Ribs with Sauerkraut for the slow cooker brings the family to the autumn table with a minimum of effort. As soon as the seasons change, my heart and taste buds travel to the flavors of Germany. Although I’ve never been there, it’s on my bucket list of places I dream of going. However, with recipes like German Pork Ribs with Sauerkraut, I like to imagine myself already there. **Please Note – The printable recipe card with detailed instructions, complete ingredient measurements, and nutritional information for making German Pork Ribs and Sauerkraut for the Slow Cooker is available near the end of this post. For this recipe of German Pork Ribs with Sauerkraut, I used pork country ribs because they were on special at my grocery store. If you’re familiar with country ribs, then you know that they tend to have a bit more fat than baby back ribs. What I like about country ribs for the slow-cooker is that as the ribs cook, the fat slowly melts into all the other ingredients in the cooker, imparting everything with that great pork flavor. If you’re worried about this dish being greasy or fatty tasting, no worries. 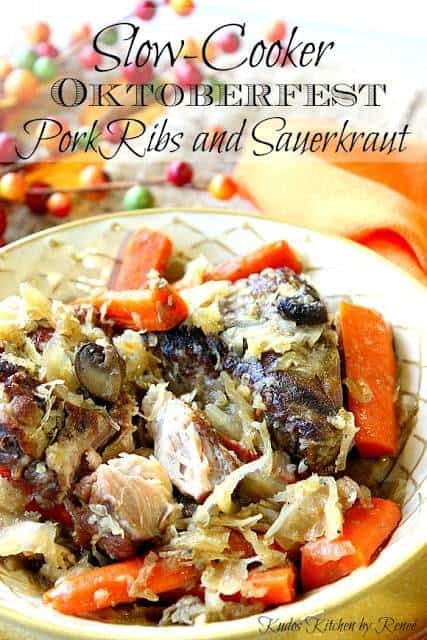 The acidic bite of the sauerkraut cuts through the fatty pork, and along with the sweet from the apple cider, balances all the flavors nicely. Is there a trick to getting the MOST flavor from this slow cooker meal? To give this German Pork Ribs with Sauerkraut for the slow cooker the most flavor possible, I encourage you to spend the time in preparation to brown the country ribs on all sides before adding them to the cooker. Also take the time to cook down the onions, mushrooms, and cut carrots to intensify their flavor. Adding apple cider added to the pan will deglaze the pan and get up all the stuck on brown bits (fond) from the bottom of the pan imparting even more flavor to the sauce before adding it to the cooker. In a large skillet, brown the seasoned (salt and pepper) ribs on all sides in the oil over medium/high heat. In the same skillet, add the butter to the skillet and saute the mushrooms and onions, stirring occasionally, until the onions are limp and slightly golden (approximately 5 minutes). Season the mushrooms and onions lightly with salt and pepper. Stir. Add the sauteed mushrooms and onions to the slow cooker along with the browned ribs. Add the sliced carrots to the skillet and cook, stirring occasionally for 5 minutes. Season lightly with salt and pepper. Reduce the heat to medium and add the apple cider, and the allspice to the skillet, making sure to scrape up the browned bits from the bottom of the pan. Carefully pour the contents of the skillet into the slow cooker. Add the prepared sauerkraut to the cooker and lightly stir to combine. Cover the cooker and set for 6 hours on low, or 4 hours on high. 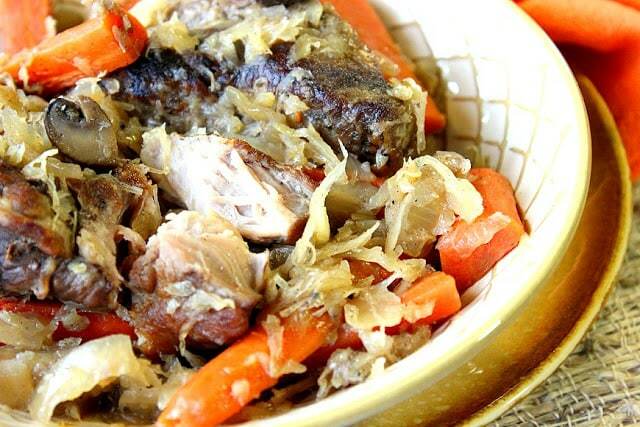 Spoon the German Pork Ribs with Sauerkraut onto a plate or bowl, and enjoy! Even though this German Pork Ribs and Sauerkraut is a favorite for Oktoberfest, please don’t feel like you have to wait until the end of the year to enjoy this tasty meal. 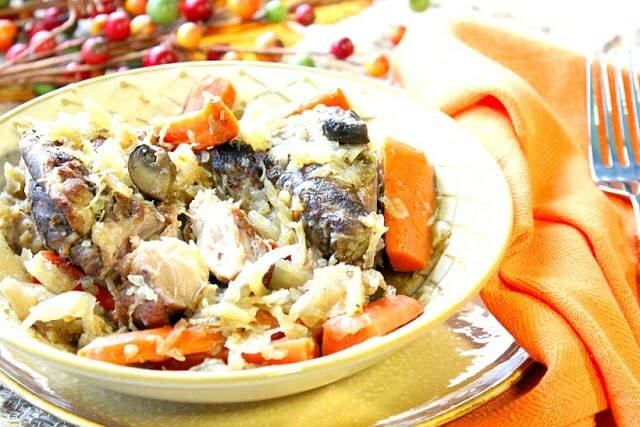 This is also a terrific dish in the spring and summer as well. Especially when you don’t want to heat up the house by turning on the oven, but you’re still looking for some food comfort but without all the heat! This recipe for German Pork Ribs with Sauerkraut for the slow cooker has become one of the most popular recipes on my blog. 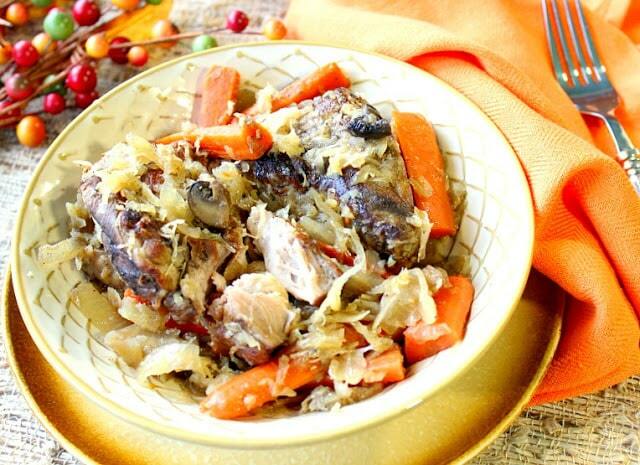 It’s comforting, easy, and completely delicious if you’re a fan of German flavors. I do hope you’ll try it and then come back and let me know what you think. **The following affiliate links are some suggested products I’ve chosen that will aid you in the making and serving of this recipe for German Pork Ribs with Sauerkraut if needed. By clicking on the item photo, you’ll be taken directly to Amazon.com if you’re interested in purchasing any of these products. You are in no way required to do so, and you will not be charged in any way unless you decide to purchase one of these products through Amazon.com. As an Amazon Associate, I earn from qualifying purchases. German Pork Ribs with Sauerkraut for the slow cooker with carrots, and onions. A delicious German meal with minimal hands-on preparation time. Brown the pork ribs in canola oil in a large skillet over medium/high on all sides. Once browned, transfer the ribs to a 6-quart slow cooker. Reduce the heat in the skillet to medium and add the butter. Stir the onions and mushrooms into the skillet and cook, stirring occasionally for approximately 3-4 minutes. Season lightly with salt and pepper. Transfer the onions and mushrooms to the slow cooker, over the pork ribs. Add the carrots to the skillet and season with the remaining salt and pepper. Cook, stirring occasionally for approximately 5 minutes. Add the apple cider and allspice to the pan, making sure to scrape up the browned bits from the bottom of the pan. Carefully pour the carrots and apple cider mixture into the slow cooker. Add the sauerkraut to the cooker, along with the liquid. Cover the slow cooker and set the timer for 6 hours on low. or 4 hours on high. Remove the lid from the cooker for the last 30 minutes of cooking for the sauce to thicken slightly. 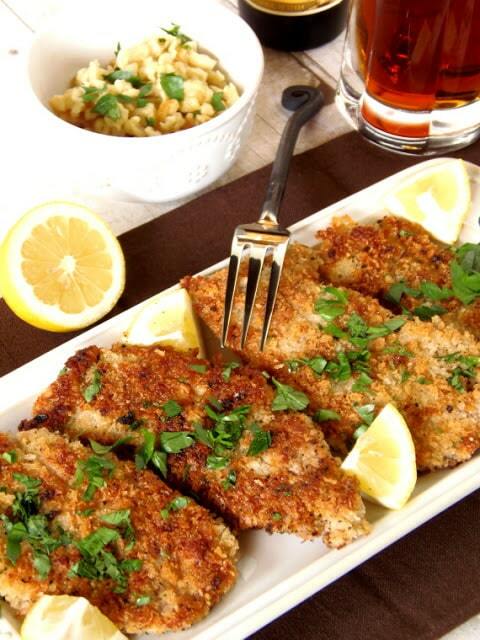 Remove the ingredients with a slotted spoon and pour over mashed potatoes or spaetzle to serve. I sincerely hope you’ve enjoyed today’s recipe for German Pork Ribs for the Slow Cooker as much as I’ve enjoyed bringing it to you! The wine glass I’ve chosen to coordinate with the above Oktoberfest recipes is one that was a special custom order from an x-ray technician. The quote on the base of the glass is from Anna Bertha Roentgen, who was married to Wilhelm Roentgen (a physicist), from Germany. Wow, that’s a long way for me to reach just to coordinate a wine glass to a recipe post. But in all actuality, the glass reminds me a little of Halloween, and since its October…all’s fair, right? HeHe! Should you have any questions regarding this or anything else you’ve seen on my site, please don’t hesitate to contact me directly, or leave me a comment in the comment section below. It is always my distinct pleasure to get back to you with a reply just as soon as I possibly can! I'm all about that slow cooker right about now! I really like the idea of ribs in the slow cooker, but transformed into something more than just "ribs." Such a fun and hearty meal! Pork in the slow cooker is so good! I'm with you, I love the pork fat melting onto the other veggies! You would love Germany this time of year! Such a fun place to be. great recipe. This sounds perfect for fall! Gotta love sauerkraut! 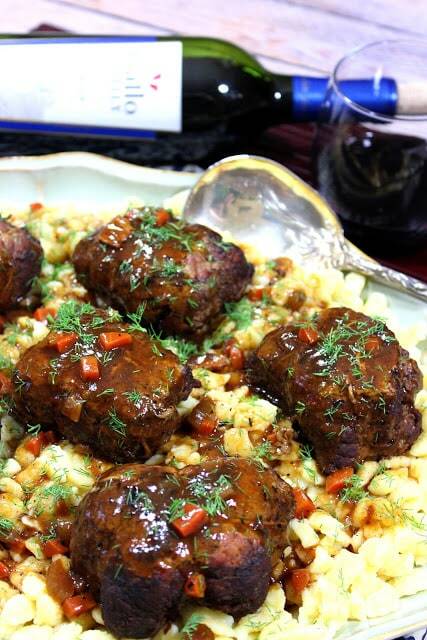 I'm originally from Stuttgart, Germany and I'm always happy to see German-inspired dishes 🙂 This is such a great idea and I can almost smell the aromas wafting through my computer screen! You make the dish look so pretty! I'm ready for beer and sauerkraut! Cider…sounds interesting! My husband would be all about this! 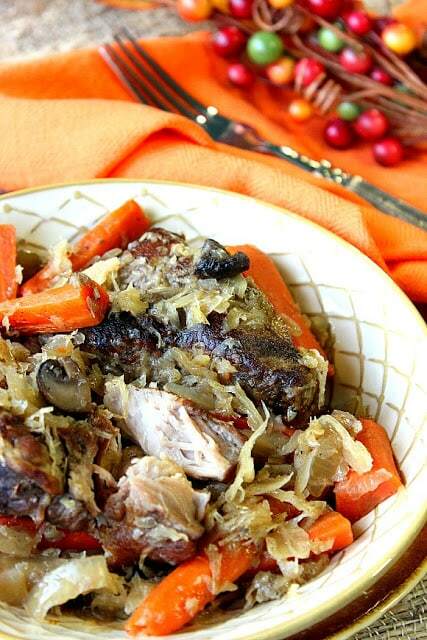 I never make him sauerkraut or ham & cabbage since I don't eat them…he feels deprived! Maybe I will surprise him with your dish this week! Then I will pull out the paint colors…haha! This looks so flavorful! Slow cooker is my best friend! And this one looks fantastic! Can't wait to try! What an awesome Octoberfest recipe! This looks like the perfect comfort food! Certain people love sauerkraut and some people do not. I'm in the camp that LOVES it so this recipe is right up my alley! Sauerkraut baby! That's where it's at! This sounds so good to me! I have a serious soft spot for pork and sauerkraut. It is an annual tradition for us on New Year's Day! I think I'll be making this recipe before New Year's Day this year! Yum!